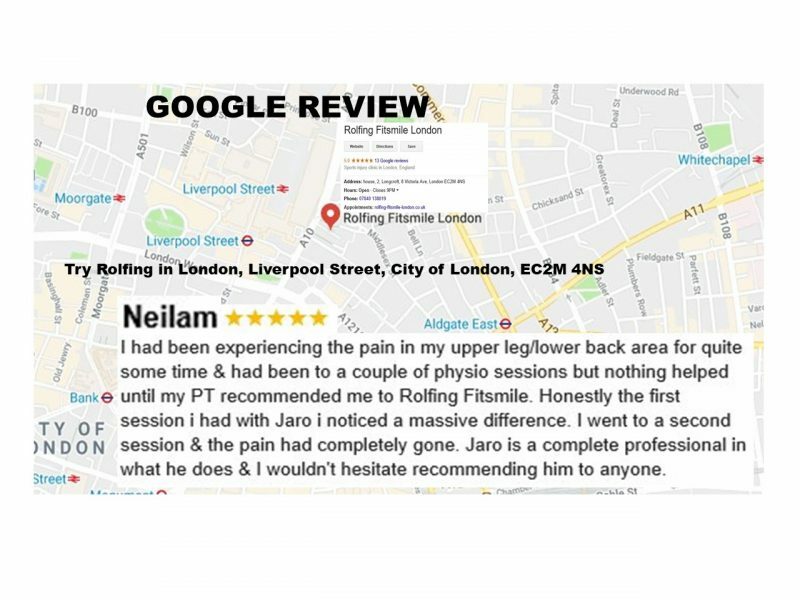 Rolfing Fitsmie London Jaro Wojciechowski, Try Rolfing in London, Liverpool Street, City of London, EC2M 4NS testimonials, reviews and recommendations: Curing whiplash, improving posture and body mechanics, fixing pulled hamstring, sore back, painful shoulder, stiff neck. 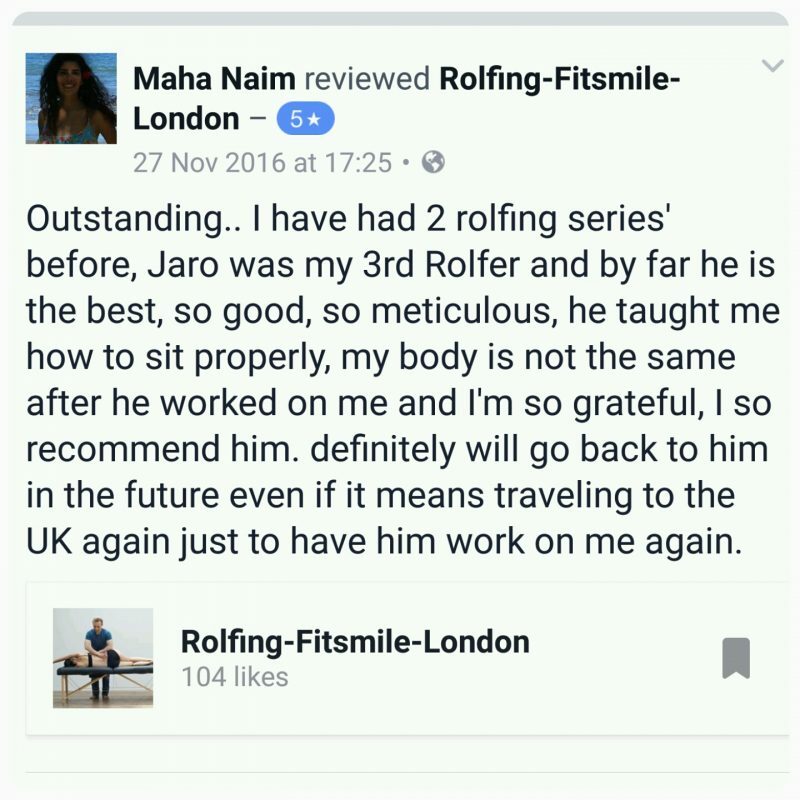 Dr. Maha’s Rolfing London experience. 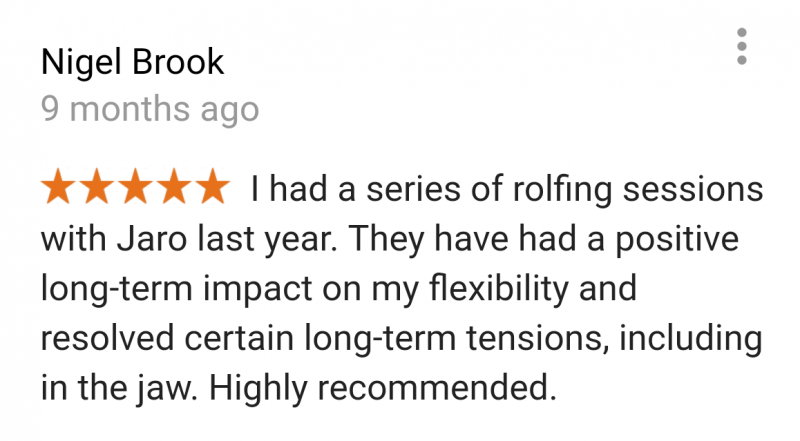 Great experience – Rolfing 10 series reviewed by Christian. “Great experience. Thoughtful, meticulous and methodical, Jaro is a wonder! His program is designed to treat the body as a whole, you rock up with a bad shoulder and then find it’s a symptom of a tight hip flexor or something you hadn’t even realised was an issue. Case in point, I limped in there yesterday with two sore knees amongst a list of other ailments, after he’s attacked my hamstring on that side, that knee no longer hurts. SHOULD YOU TRY ROLFING? 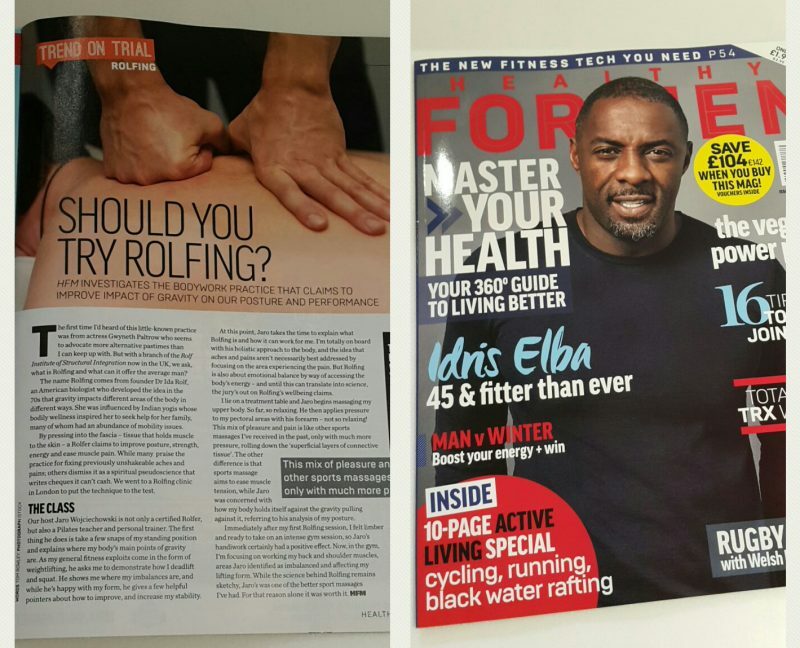 Healthy for Man magazine investigates Rolfing. SHOULD YOU TRY ROLFING? HFM INVESTIGATES THE BODYWORK PRACTICE THAT CLAIMS TO IMPROVE IMPACT OF GRAVITY ON OUR POSTURE. AND PERFORMANCE. The first time I’d heard of this little-known practice was from actress Gwyneth Paltrow who seems to advocate more alternative pastimes than I can keep up with. 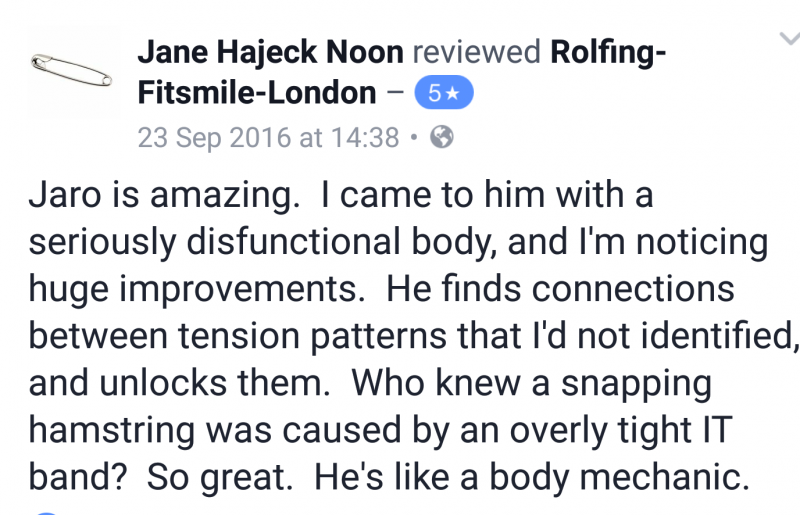 But with a branch of the Rolf Institute of Structural Integration now in the UK, we ask, what is Rolfing and what can it offer the average man? The name Rolfing comes from founder Dr Ida Rolf, an American biologist who developed the idea in the 70s that gravity impacts different areas of the body in different ways. She was influenced by Indian yogis whose bodily wellness inspired her to seek help for her family, many of whom had an abundance of mobility issues. 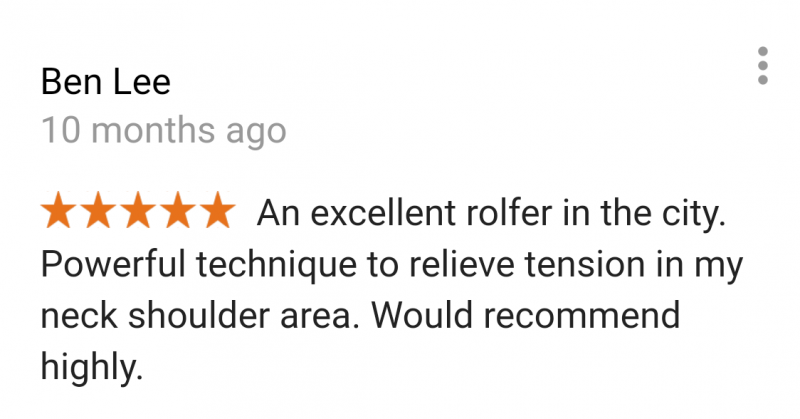 By pressing into the fascia – tissue that holds muscle to the skin – a Rolfer claims to improve posture, strength, energy and ease muscle pain. 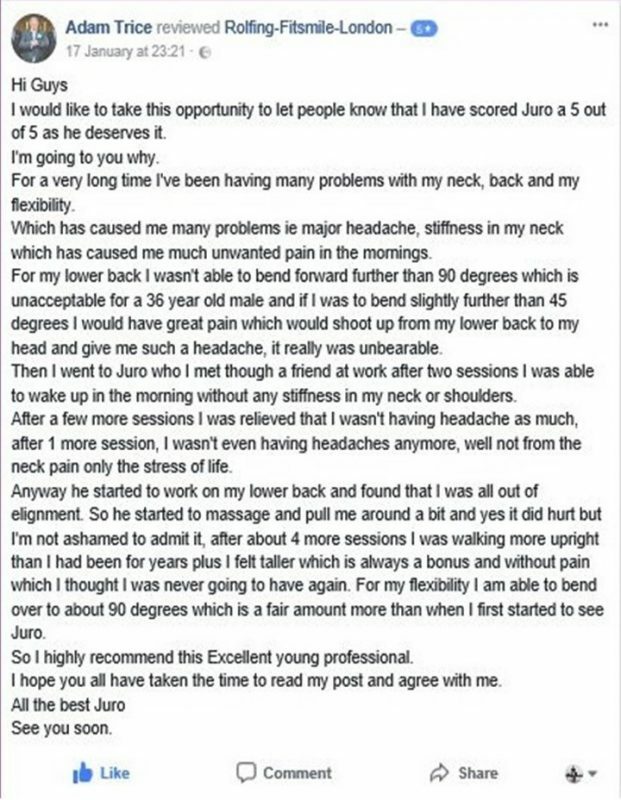 While many praise the practice for fixing previously unshakeable aches and pains; others dismiss it as a spiritual pseudoscience that writes cheques it can’t cash. We went to a Rolfing clinic in London to put the technique to the test. Our host Jaro Wojciechowski is not only a certified Rolfer, but also a Pilates teacher and personal trainer. The first thing he does is take a few snaps of my standing position and explains where my body’s main points of gravity are. As my general fitness exploits come in the form of weightlifting, he asks me to demonstrate how I deadlift and squat. He shows me where my imbalances are, and while he’s happy with my form, he gives a few helpful pointers about how to improve, and increase my stability. 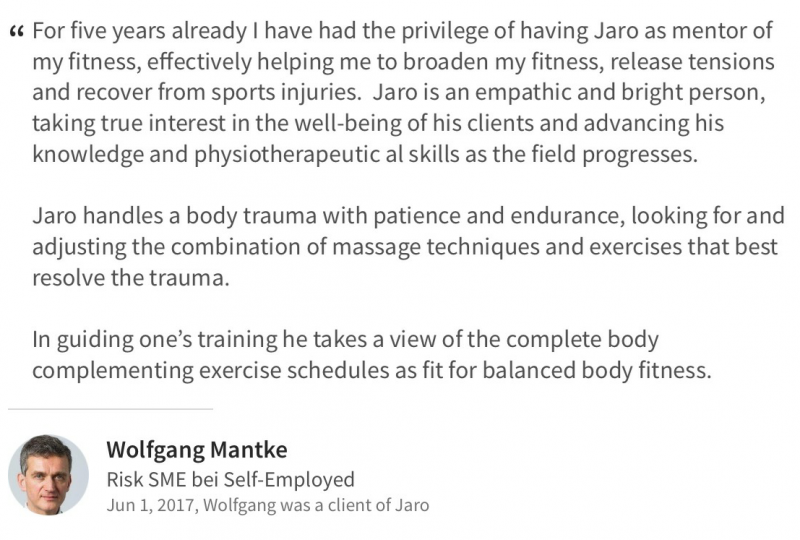 At this point, Jaro takes the time to explain what Rolfing is and how it can work for me. I’m totally on board with his holistic approach to the body, and the idea that aches and pains aren’t necessarily best addressed by focusing on the area experiencing the pain. But Rolfing is also about emotional balance by way of accessing the body’s energy – and until this can translate into science, the jury’s out on Rolfing’s wellbeing claims. I lie on a treatment table and Jaro begins massaging my upper body. So far, so relaxing. He then applies pressure to my pectoral areas with his forearm – not so relaxing! This mix of pleasure and pain is like other sports massages I’ve received in the past, only with much more pressure, rolling down the ‘superficial layers of connective tissue’. 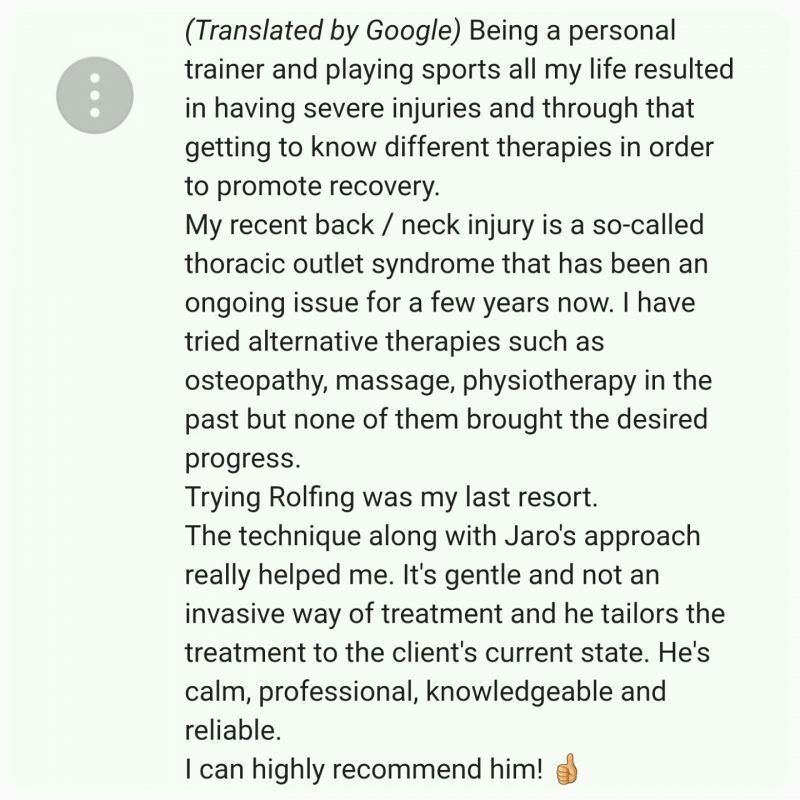 The other difference is that sports massage aims to ease muscle tension, while Jaro was concerned with how my body holds itself against the gravity pulling against it, referring to his analysis of my posture. Our tester visited certified Rolfer Jaro Wojciechowski to sample this specialised form of bodywork. For as long as I can remember I’ve been guilty of slouching and, as a result, my posture leaves a lot to be desired. 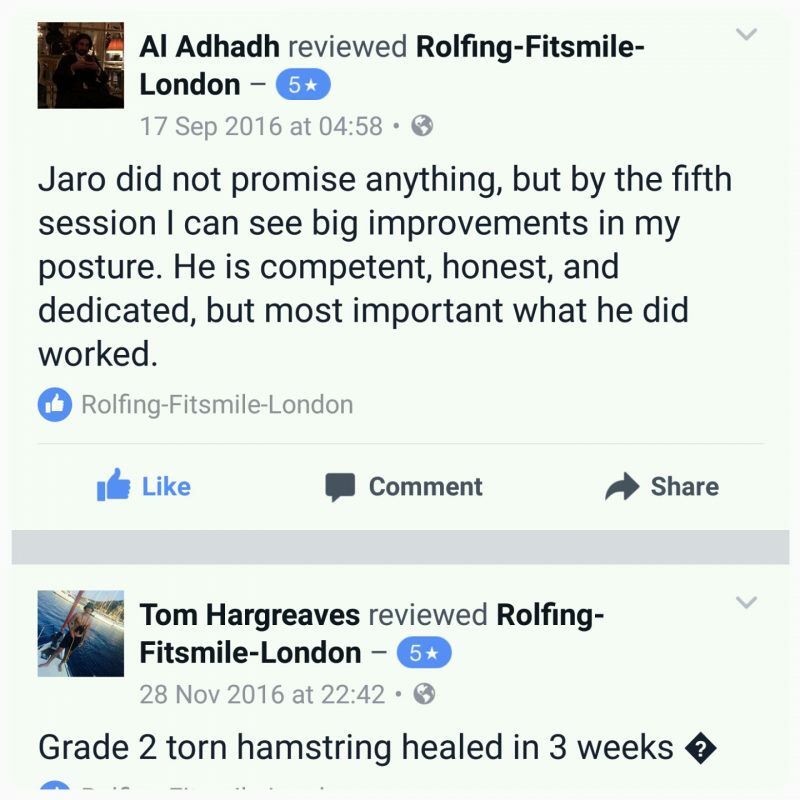 So when I visited Jaro Wojciechowski to try out a session of Rolfing. I was intrigued to see whether he could help me to walk tall and iron out my various aches and pains. Named after its founder, Dr Ida P Rolf, this method of bodywork reorganises the connective tissue, or ‘fascia’ to release, realign and balance the body. The treatment takes place over a course of 10 sessions and the aim is to help restore the body to its most efficient form to enable full ease and freedom of movement. Absolutely- I will keep you posted. convince to sign-up to a course. It is magical. Thank you again, I am so appreciative of you and the team. 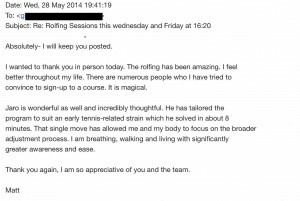 Rolfing London. Whiplash injury. Client testimonial. from Jaro Wojciechowski on Vimeo. Jaro has been my personal trainer since September 2010. I found him originally as I was 18 months past a major discectomy and significant nerve damage. I was one year into a gentle exercise routine. From the beginning, I was impressed with Jaro’s focus and research on my particular situation. 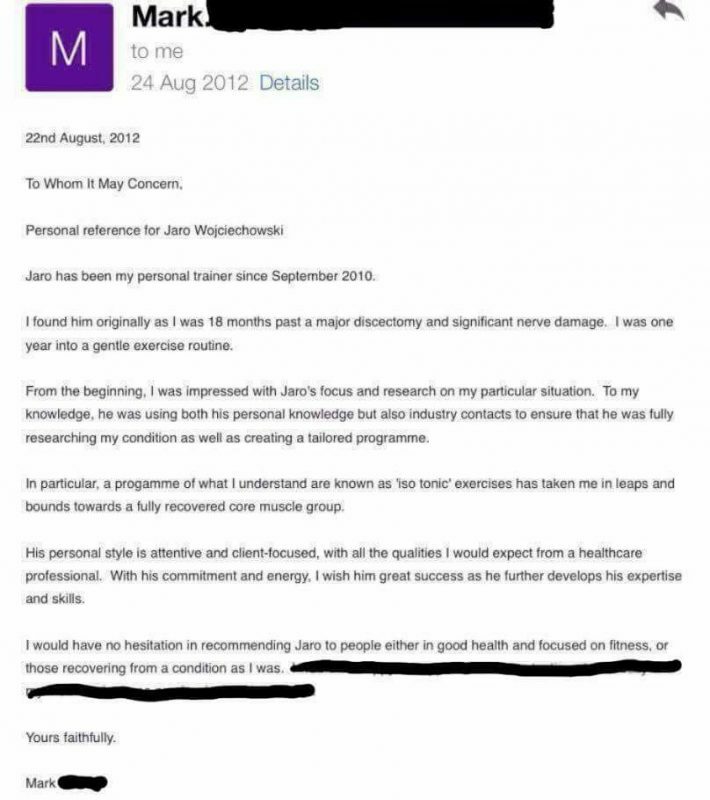 To my knowledge, he was using both his personal knowledge but also industry contacts to ensure that he was fully researching my condition as well as creating a tailored programme. In particular, a progamme of what I understand are known as ‘iso tonic’ exercises has taken me in leaps and bounds towards a fully recovered core muscle group. His personal style is attentive and client-focused, with all the qualities I would expect from a healthcare professional. With his commitment and energy, I wish him great success as he further develops his expertise and skills. 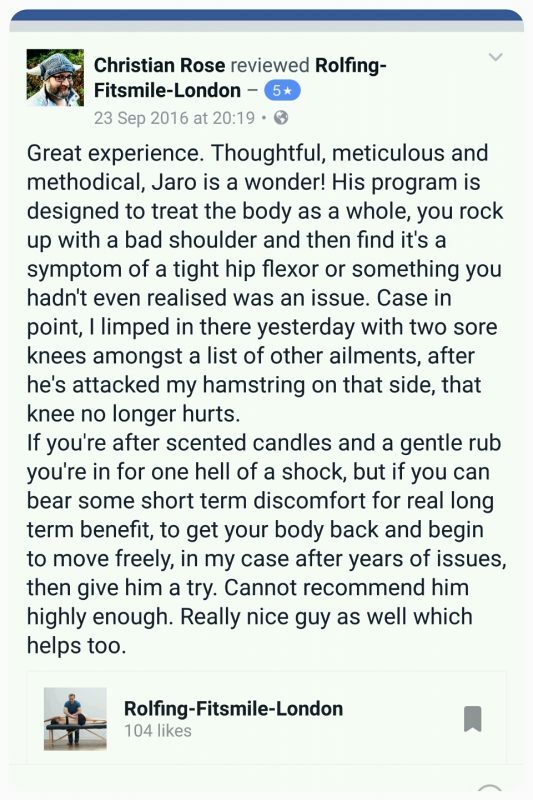 I would have no hesitation in recommending Jaro to people either in good health and focused on fitness, or those recovering from a condition as I was. ……………. . 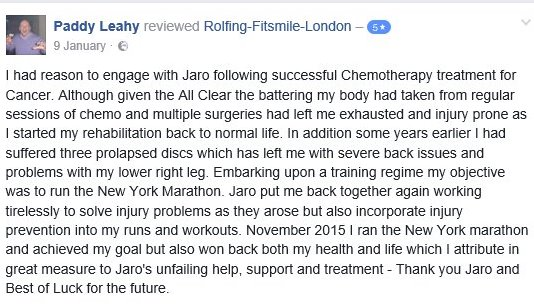 Fixed pulled hamstring with Rolfing in 4 weeks: Mark’s story from Jaro Wojciechowski on Vimeo. I have been doing ballet for 3 years and somehow I managed to hurt my back so badly I could hardly walk. My flexibility was completely gone and although I consider myself to have good body awareness I was completely lost with the fixing of my problem. I had an audition coming up and not only I needed to be ok, I wanted to be on top form. During first session with Jaro and we spent some time doing some massage and some other practices to help increase my body awareness. Next time I was in the gym he showed me some Pilates exercises specifically to strengthen different layers of my abdominal muscles. He also pointed out that I was in a bad habit of using my body in an inefficient way and this is how I got the back injury, basically overworked my back and I needed to strengthen the abdominal muscles in the correct way to help relieve the muscles in my back. This made me think a lot and it made a lot of sense. I was very much looking forward to every session I had with him, he made it very comfortable, and his attention to detail was astonishing. He showed me a better/more efficient way to think about and carry out movement and helped me relax muscle tension in areas I didn’t even know I was holding it. By the time of the audition I was much much stronger and gained my confidence back. The Pilates exercises also helped me a lot with my warm up routine and I turned up to the audition ready. “Jaro Wojciechowski has provided personal coaching to me from January 2012 to date. I have found Jaro to be helpful and knowledgeable; the sessions have been stretching and are always evolving in accordance with my development. I am 60 and we have been working at the appropriate level of intensity for someone of my age and fitness. The sessions have principally focused on balance and on raising fitness; I have been pleased with the results and I am motivated to continue with the programme. 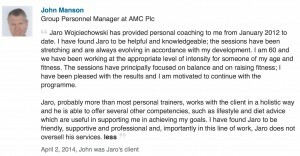 “I would like to recommend Jaro as a personal trainer. I met Jaro about 18 months ago and I had just come out of a 6 year relationship and my health was quite bad. Not only did Jaro become my personal trainer for a year he also become my agony aunt for the first couple of months. I only mention this to highlight that Jaro is a great listener. He managed to take me from being really unhealthy and not able to do much in the gym to transforming how I felt physically over the first 6 months. Jaro was able to listen to what I was saying to him about my body and my injuries. I had a really bad back and problems with my feet which prevented me from walking properly sometimes. This normally made going to the gym difficult as all the conventional training equipment wouldn’t work for me. Jaro was there to teach me techniques to help me get stronger even when I couldn’t walk well or an injury was playing up. I have had other trainers before and they didn’t listen to what I was telling them about my body. I found it is very important for a trainer to listen to what the client is telling them. Jaro is one of those good trainers! 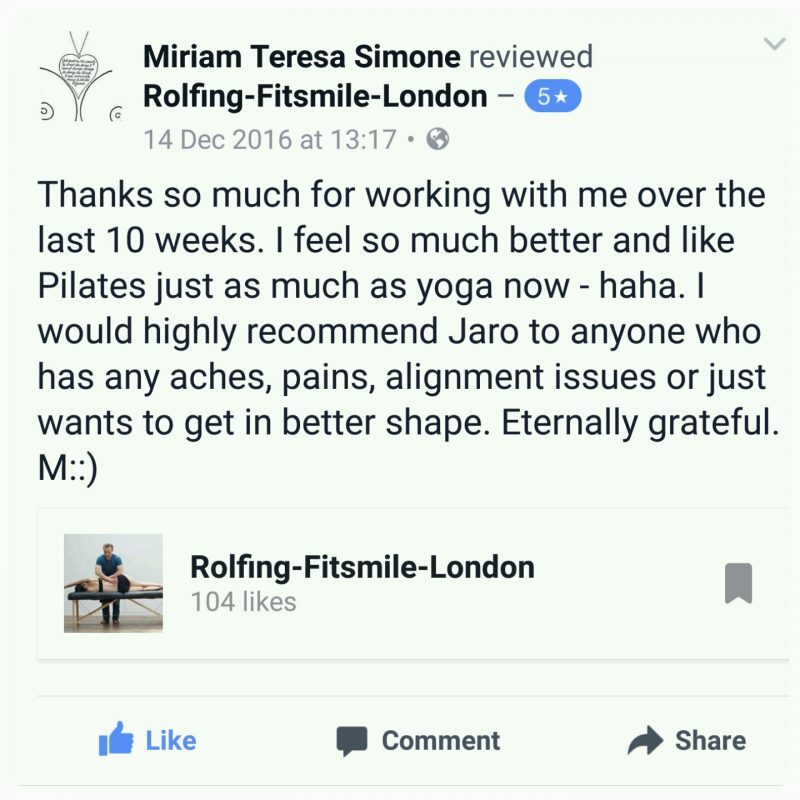 Jaro’s knowledge in Yoga and Pilates technique as well as less impacting exercises helped me virtually get rid of my back problems which had been causing me problems for years. It took 6 months of hard work with Jaro, but to this day I think if I had not met Jaro I wouldn’t be doing so well today and I rarely have back problems today. 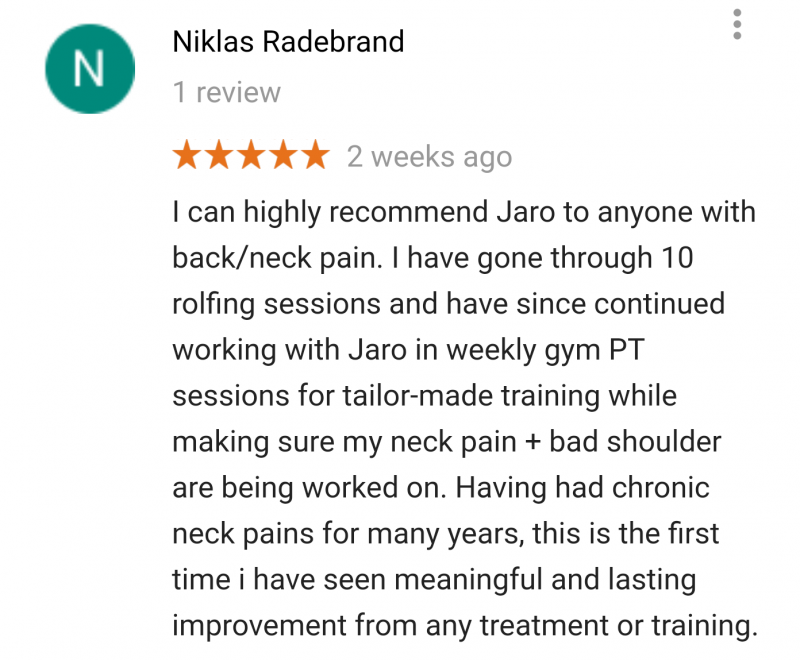 ” I started training with Jaro around 4 months ago because I was having problems with my back and was seeing a Chiropractor. In my introductory session Jaro very confidently reassured me that all of this could be changed with the exercises he would propose. So I went for it and have stayed regular to the exercises. 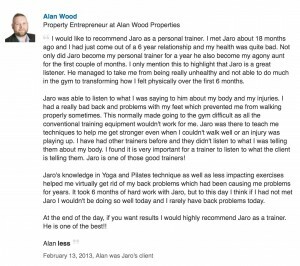 I have found Jaro to be very good at picking up on what’s happening with my body and works fairly intuitively with the exercises he gives combined with my feedback on how they have been going. 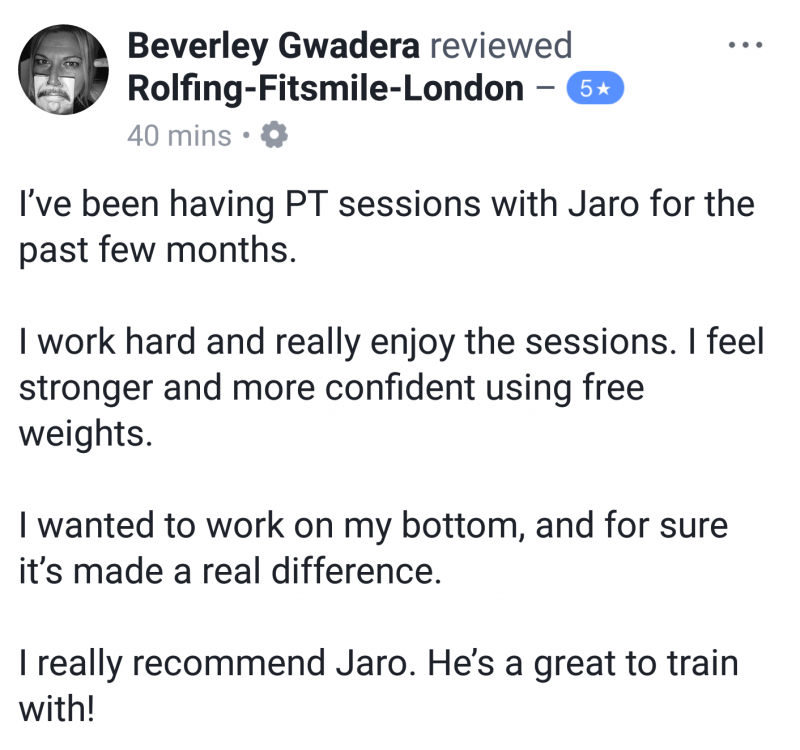 Jaro’s speciality is to home in on details of technique until they are perfect and it’s this is where I found it made all the difference to have a personal trainer like Jaro. My back and core are now probably the strongest I have known them to be. I really like Jaro’s approach to gradual improvement and sustaining long term results without harming the body in the process. It’s really helped me learn about my body and what it can and cannot do yet! 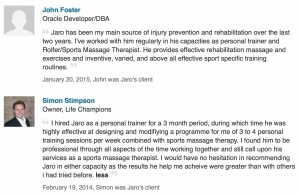 “I’ve been having PT sessions with Jaro for the past few months. I work hard and really enjoy the sessions. I feel stronger and more confident using free weights. I wanted to work on my bottom, and for sure it’s made a real difference. Five stars google rating and review – meet Zsofia. 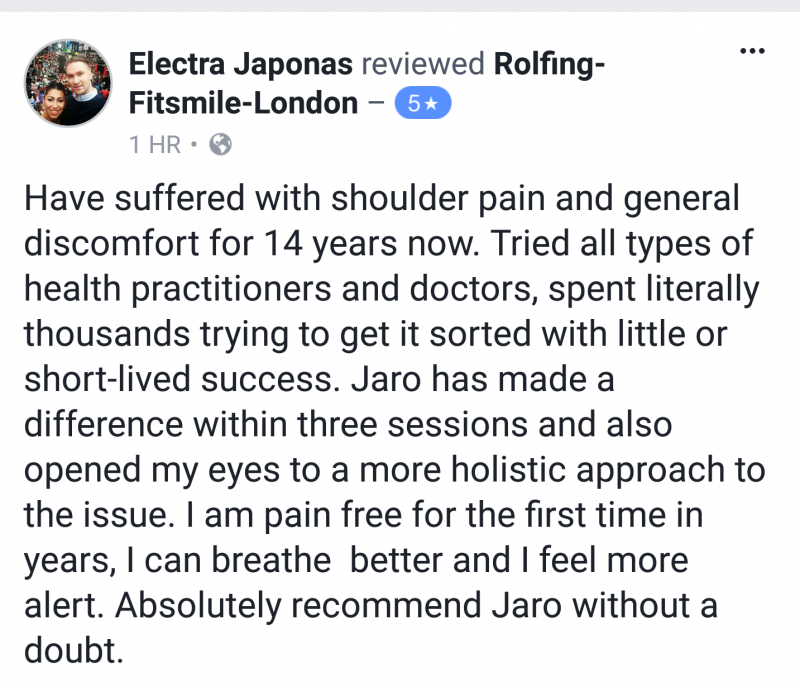 Here’s her experience with trying Rolfing therapy at Rolfing Fitsmile London. 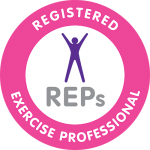 “Being a personal trainer and playing sports all my life resulted in having severe injuries and through that getting to know different therapies in order to promote recovery. My recent back/neck injury is a so called thoracic outlet syndrome which has been an ongoing issue for a few years now. I have tried alternative therapies such as osteopathy, massage, physiotherapy in the past however none of them brought the desired progress. Trying Rolfing therapy was my last resort. The technique along with Jaro’s approach really helped me. It’s gentle and not an invasive way of treatment and he tailors the treatment to the client’s current state. He’s calm, professional, knowledgeable and reliable. 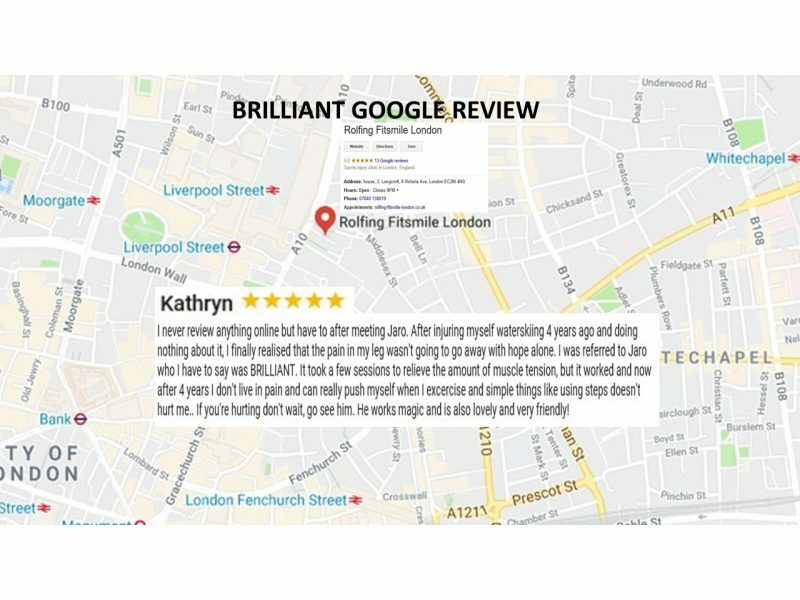 Thank you so much Kathryn for your BRILLIANT 5 stars Google review! 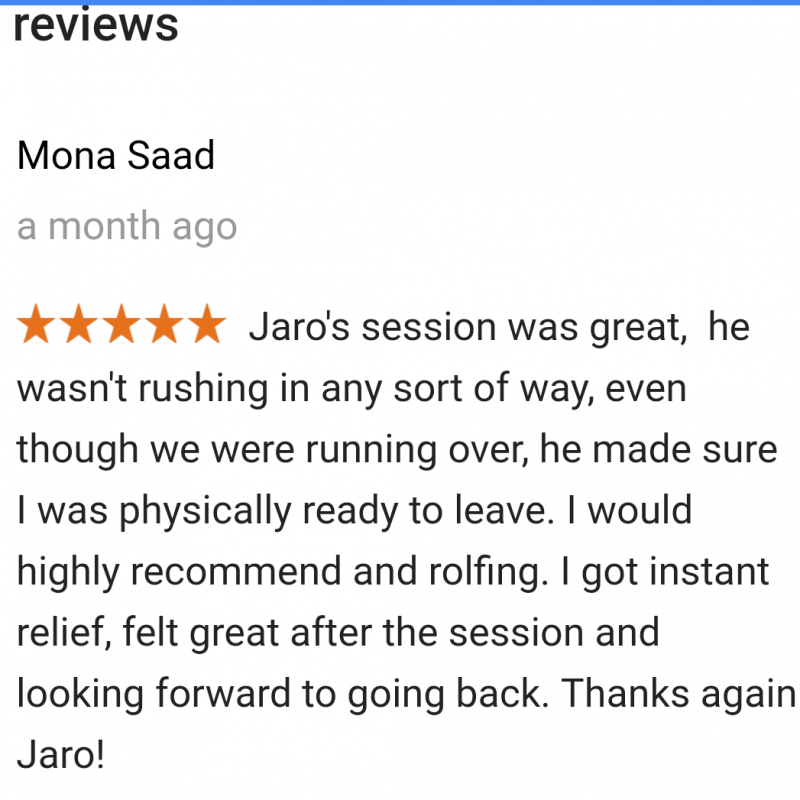 Rolfing from Jaro is an investment in your health. 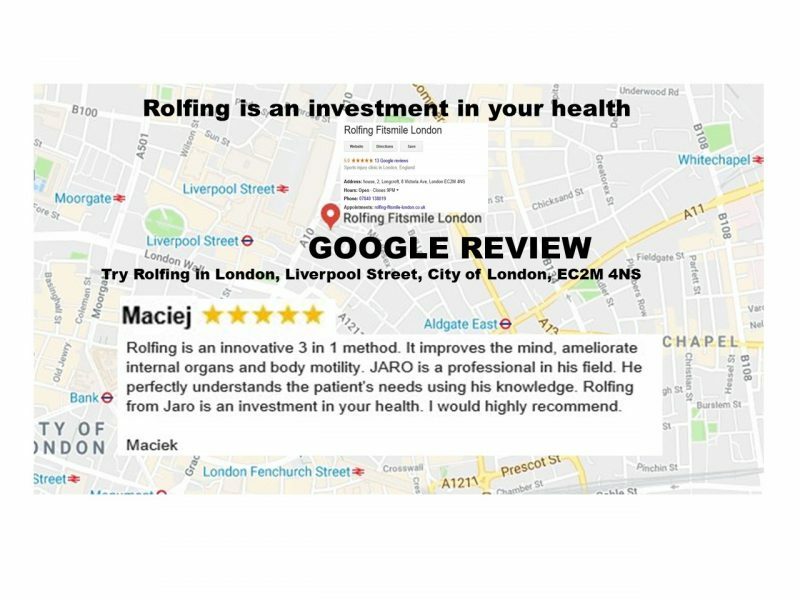 Five stars Google review – meet Maciek! ” Rolfing is an innovative 3 in 1 method. It improves the mind, ameliorate internal organs and body motility. JARO is a professional in his field. He perfectly understands the patient’s needs using his knowledge. 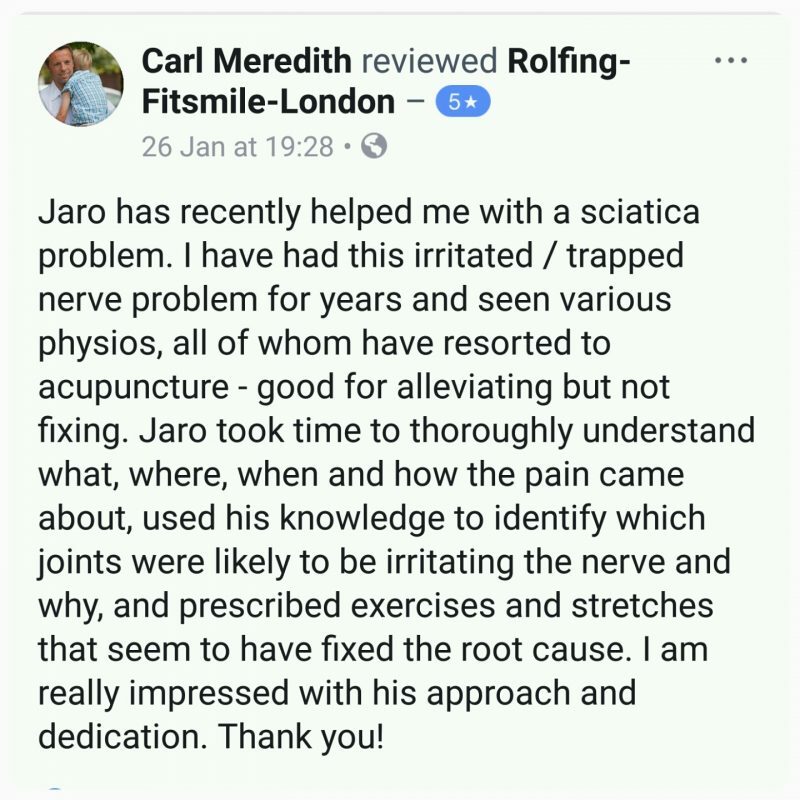 Rolfing from Jaro is an investment in your health. I would highly recommend.” Maciek. I would like to take this opportunity to let people know that I have scored Jaro a 5 out of 5 as he deserves it. I’m going to you why. For a very long time I’ve been having many problems with my neck, back and my flexibility. Which has caused me many problems ie major headache, stiffness in my neck which has caused me much unwanted pain in the mornings. For my lower back I wasn’t able to bend forward further than 90 degrees which is unacceptable for a 36 year old male and if I was to bend slightly further than 45 degrees I would have great pain which would shoot up from my lower back to my head and give me such a headache, it really was unbearable. Then I went to Jaro who I met though a friend at work after two sessions I was able to wake up in the morning without any stiffness in my neck or shoulders. After a few more sessions I was relieved that I wasn’t having headache as much, after 1 more session, I wasn’t even having headaches anymore, well not from the neck pain only the stress of life. Anyway he started to work on my lower back and found that I was all out of elignment. So he started to massage and pull me around a bit and yes it did hurt but I’m not ashamed to admit it, after about 4 more sessions I was walking more upright than I had been for years plus I felt taller which is always a bonus and without pain which I thought I was never going to have again. For my flexibility I am able to bend over to about 90 degrees which is a fair amount more than when I first started to see Jaro. So I highly recommend this Excellent young professional. I hope you all have taken the time to read my post and agree with me.